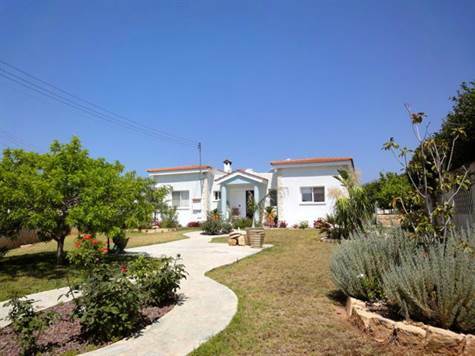 Peyia, Paphos - This impressive 3 bedroom bungalow is located on a large private plot in a quiet location a few minute’s drive from Peyia village, and the popular holiday resort of Coral Bay. An entrance foyer with guest cloakroom leads to a spacious central living room with feature fireplace. Patio doors provide easy access to a covered veranda overlooking the pool terrace. Through an archway is the well equipped kitchen with white fitted units, central island, granite worktops and an additional storage room with further cupboards. Off the living area are three good size double size bedrooms. The master bedroom has a walk through closet with plenty of wardrobe space, and a modern en-suite including vanity unit, bath and separate shower. Bedrooms 2 and 3 also have en-suite shower rooms, all finished to a high standard. The pool terrace can be accessed directly from both the master and second bedroom via patio doors. From the pool terrace, the unobstructed sea and mountain views are absolutely stunning. On the one side is an outbuilding with a separate utility room, changing room with sink and toilet, and the third room houses the pump for the swimming pool. The mature gardens are nicely landscaped with a variety of trees, shrubs and lawned areas and at the side of the property is a large driveway and car port. There are full title deeds.